St. Dominic's is a Dominican Parish in San Francisco. Established in 1873, it supports a lively community of clergy, parishioners, including the Novitiate for the Western Dominican Province. We invite you to come worship with us! Dominicans first came to San Francisco in 1850 when the Most Reverend Joseph Sadoc Alemany, Father Sadoc Francis Vilarrasa and Mother Mary of the Cross Goemere arrived from Spain via several other appointments in the United States. Bishop Alemany had been appointed Bishop of Monterey and invited Fr. Vilarrasa to accompany him to California. The Archdiocese of San Francisco was created in 1853 and Archbishop Alemany was its first incumbent. As early as 1984, engineering tests had determined that the church was seismically unstable. Work began immediately to find a solution and a way to pay for it. The Saint Dominic's Preservation and Restoration Project began its work in 1986. By June 1991, sufficient funds had been raised to begin the construction of nine flying buttresses that rise from concrete piers deep underground and soar to connect at a ring beam that girdles the church at the roof line. This medieval concept was found to be the best solution to a late 20th century problem. But the cost was in 1992 dollars: $6.6 million. Parishioners and friends from around the world confirmed the importance of this Church by raising all the needed funds. Construction was completed in July 1992, and Archbishop John R. Quinn of San Francisco dedicated Saint Dominic's Church on August 1, 1992. 1853 - Archdiocese of San Francisco is created. 1854 - Cathedral of St. Mary (Old St. Mary's) is built. 1863 - First Dominican Priory in San Francisco is established. 1870 - The first St. Dominic's Church at the corner of Bush & Steiner is blessed. 1876 - The Priory of St. Dominic is formally established. 1883 - The cornerstone of the second St. Dominic's Church is laid. 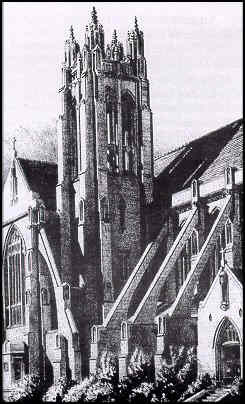 1887 - Second St. Dominic's church opens. 1906 - The Great Earthquake destroys St. Dominic's Church. Mass is held outdoors until October of 1906, a wooden church (third church) opnes on the Pierce Street side of the block. 1923 - Construction begins on fourth St. Dominic's Church. 1928 - Fourth St. Dominic's Church is completed. 1984 - Engineering tests determine St. Dominic's Church is seismically unstable. 1986 - St. Dominic's Preservation and Restoration Project begins. 1992 - Construction is completed. Archbishop John R. Quinn dedicates St. Dominic's Church on August 1, 1992. 1998 - Phase II of the Restoration Begins. 2000 - St. Dominic's celebrates the Millennium Jubilee with a Solemn Mass at Midnight on January 1st. 2002 - On August 13th, the Novitiate of the Western Dominican Province is moved to St. Dominic's. 10 men begin their formation as future Dominican frairs.